What was nothing more than a casual hangout for a small group of adolescents turned deadly serious when one of the females in the group was overcome with the need to inform her peer that she would be transferring schools in the near future. In a spurt of serious desperation, one of them revealed that they knew of a spell that could enable them to always remember each other. The majority of the group showed no hesitation as they reached for the preternatural paper whose visible silhouette could be likened to that of a human. On the same count, they pulled at the paper, and waited in anticipation. When nothing did, they gathered up their belongings and parted their separate ways. However, at that moment, a powerful tremor shook the ground beneath their feet. Whatever the reason was, the party found themselves blacking out, and the very next conscious experience was probably the most horrific one: the paper was a curse, and it had teleported them into different dimensional planes within Heavenly Host Elementary School. Split up and disoriented, the members were in for the most terrifying experience of their youth. With no choice but to wander, the young students roamed the grounds, their phantasmagorical experiences seemed to to form a chain, from disturbing to downright petrifying. From corpses strewn haphazardly across the school, to a band of ghastly children whose only precognition was to prevent their escape, they were in for the chase of their lives, and they weren't the predators this time. 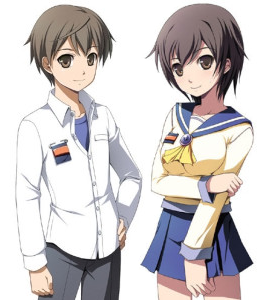 Corpse Party consists of several chapters, all of them having only one true ending (albeit for Chapter 5). You will start off in chapter 1. Unless you can get the true ending for that chapter you will not be able to unlock chapter 2 and so on. There's many wrong endings within each chapter that I will try to list, there's also various ways to get the same wrong ending, I will merely list the fastest and simplest way to get that ending. 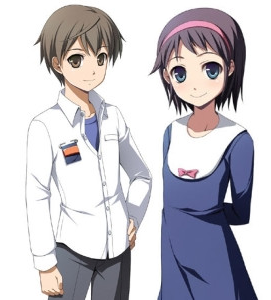 There's a lot of gameplay involved in Corpse Party rather than just making choices within the dialog (not to mention most of these don't have any real effect) so be prepared for a lengthy walkthrough. The main purpose of this guide is to help people figure out the right order of things they need to do or where to go in order to proceed because this novel will cause you to get stuck often if you are not thorough in every little detail or don't pay attention, to top it off, when you get a bad ending you are often forced to replay the entire chapter with unskippable text. My advice is that you save often whenever you get the chance, it's the key to avoiding having to re-read a ton of stuff (unless you are using an emulator, in this case the quick save function of the emulator comes in hand a lot). This walkthrough will be as spoiler free as I can make it. When the Chapter 1 opening finishes, go north as far as you can to see someone on the other end of the room. Go back down and east to leave the room. Walk north for a short scene and continue on into the other open doorway. Approach the person on the floor to progress. 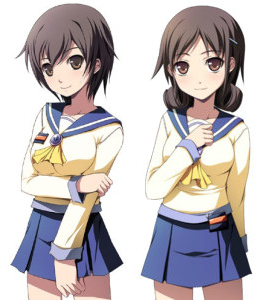 After you are done with the Character Introductions, you will find yourself controlling Naomi and Seiko in Classroom 1-A. Leave the room through the nearby doorway and you will be in a hallway. Head south to the only other doorway (both the north and south paths are blocked by gaps at this time). Back in the hallway, head to the nearby gap and press X when facing it. You will be asked to use the board to bridge the gap. Do it and cross it, heading down to a stairwell. There is a candle here. These are the save points of the game and it is a good idea to save at each of them. When you are finished, head down the other stairs to the west hall of the first floor. Head east until another large gap and follow the turn south. At the bottom, you will find a door. Pressing X on it reveals that it is shut tight. Walk back to the staircase and go back up to the second floor. As you cross back over the Loose Board, the screen begins to shake. The gap is now too large to cross with the board so you can pick it back up. Go north to the other gap and use the board on it to cross. Straight up is another staircase with a short scene but the third floor is blocked. Head back out of the stairwell and into the open classroom door. Walk north and watch the scene. Examine the bone pile afterwards for a bit of story explanation. When given a dialogue choice, either option works but offer slightly different dialogue (I suggest "Confined" as it explains a bit more about the situation). You will be forced out of the classroom at the end. Just go back inside when you get control. A candle is now present. Save but don't go through the new door yet. Instead, go back out the southern door and back over to the stairway just to the west. In the stairwell now is a new blue spirit. Talk to him and he will drop an [unknown Key] for you. This key is very important to avoiding a bad ending so don't miss it. Leave the stairs and head back into the classroom and out the other doorway. Head east. Note the first closed doorway to Classroom 3-A. Use your new Unknown Key to open the door. You are given a choice whether or not to enter: choose to do so. Inside, you can see a body nearby. Inspecting the body gives you the message 'Whatever you do, don't look at the newspaper.' Ignore this and look at the paper to the south. The door slams shut and the characters begin to panic. Don't worry; this is supposed to happen. Getting the door to open again can be tricky. Make sure to check the door, the top-left corner, the body, the newspaper, the bottom-right corner, and the body again. Approach the middle of the room to trigger a scene. If it doesn't happen at first, just keep doing these things. After this scene, approaching the door should cause it to open. If not, just keep doing those things until it does. The game won't trap you in there. Once out of Classroom 3-A, continue on to find another fork. The north path has another gap so go south instead. Pass both closed doors and pick up another [Loose Board] near the south exit. Leave through the south exit. Another stairway. Head down to the east hall of the first floor. Walk to the west and follow the turn north. You will see a little blue spirit along the way; he has a helpful tip for you. Continue north to another fork. Go east to the second open classroom door and enter. Head south towards the gap and you will notice a purpleish light on the other side of the room. Go out into the hallway and into the other door. The light has moved. Remember where that light is and leave. A new spirit has appeared. He gives you a hint on how to get that item. When back inside, press X on the spot you think the light was to leave Seiko there. Go back to the other side of the room and approach the light. If you were close enough, Seiko will grab the [infirmary Key] when it moves. If you were off, just try again. When you get the key, leave the classroom. Head back west to the fork and follow the path south and then east to return to the stairway. Go back up to the second floor. Now, the first closed door to your right is the Infirmary but you don't need to go in there yet. Instead, keep going north up to that gap you passed earlier and use your Loose Board to cross it. Take the stairway up to the third floor. The first door to the west is the Boys' Lavatory but you don't have to go in there. Just go in the second door, which is the Girls' Lavatory. Check the second stall from the left to find that it is locked. Leave the bathroom and head back to the stairs. After Seiko heads back to the bathroom, try to enter the stairwell. You will be stopped by a short scene. Go through the doorway afterwards and try to head down the stairs. Naomi won't let you leave. Go back up and head into the girls bathroom. Seiko will rejoin you after you enter and you can now go back down the stairs. As you head down the stairs, you will see a scene. Now you can go use that Infirmary Key. Back downstairs, cross over the gap and head all the way south again to the Infirmary door. Use the key to open the door and enter. There is a candle in the lower right corner. Saving your game before doing anything else is the best idea. Afterwards, inspect the stool-looking thing nearby to find a [box of Matches]. Head over to the beds to trigger a long scene. When you have control again, try to leave. The door is locked. Head towards the top-right corner for a few scenes. Try the door again. Step away from it again to trigger another event. Approach the desk to be knocked away from it. Step towards the door again to see a red shadow appear. A warning, this thing will kill you if it touches you. You can be touched a few times but too many will result in a Wrong End. Avoid the shadow and go back to the door. Try to burn the hair from the door with a match. It doesn't work. Now, go to the top right corner of the room and inspect the white cabinet to find [Rubbing Alcohol]. Return to the door while avoiding the shadow and use the matches and alcohol to leave. Seiko returns for a scene after you escape. When given a dialogue choice, either one works; it just changes little things in the scene to come. When you get control again, go west and follow the turn north. Choose to follow the voice when given the option. You will now find yourself in the bathroom hallway. Head into the Girls' Lavatory (second door to the west) and check the second stall from the left. Do not touch Seiko. Leave the room and pick up the nearby [Filthy Bucket]. Go back inside and try using the item on the stall. Watch the rest of the events of the chapter play out. Sadly this is how things are supposed to go. If you followed this guide to the letter, you did it right. This ending is unavoidable. Chapter 2 should be unlocked after. Skip the whole scene in Classroom 3-A and still progress to the end. There's other things you can do but they all trigger the same ending, like touching Seiko too many times when she's in the stall. Let the red ghost touch Naomi too many times in the Infirmary. You start playing as Yui the teacher. Head south first, going over the gap and past the first open door. Take the other door set in the west wall to find yourself in the southern half of that classroom. Move west to find a glowing object on the ground, a [Power Stone]. Upon trying to leave, a short scene occurs with a choice. Make sure to choose 'Give it to Shinozaki' in order to ensure your good ending. Leave when done. Head north and across the already-covered gap. Walk straight up and into the stairwell. You will find [Classroom 3-A Key] on the ground. Take it and go back out into the hallway, heading east past the first set of doors. Instead, open the door next to the pit with your new key. Moving up inside the classroom will trigger a scene. Afterwards, try to leave via the north doorway for another. When given a dialogue choice, either option works, with slightly different changes in the scene. NOTE: If during the next scenes you see at any point a message about the crystal in your inventory shattering, you need to reload your last save in order to get the best ending. A way to have it shatter is by touching the ghost that chases you down the hallways. 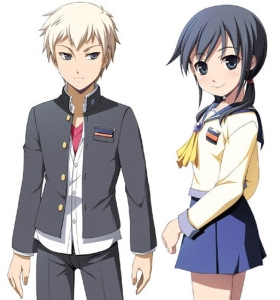 When you regain control you should be playing as Yoshiki and Ayumi, leave the classroom and head south. You can try to return to the classroom where those events just took place but the door has mysteriously vanished. Heading south leads you to a stairwell. After a brief scene, there will be a new candle. Make sure to save and continue down. Walk to the east and then go north when you reach the four-way fork (the east path is closed for now). You will see four bodies on the way. Continue past them and to another fork. Go west and enter the open classroom. Head west to see a little blue boy ghost. Walking near him is safe but make sure not to ever look directly at him eye-to-eye. Doing so will shatter your crystal and require a reload for the good ending. Move to the lower left corner to pick up the [Nail Puller]. Leave the room. your party again. Leave the room but be on your guard. back to the stairwell. I would advise waiting a moment on saving. Cross the gap and enter the second doorway to the left to find the classroom you started out in again. Go to the top-left corner to find a doorway. Use the Nail Puller to open it and go inside. Use the lever in the top-left corner to see a scene. Now you can go back to the ghost boy room and use that lever. Leave the classroom and head south back down the stairs, now you can save. Continue to avoid the ghost. Use the wider open areas (like the area right outside the stairs) to get around him more easily. One touch doesn't kill you but it ruins the crystal you need for the best ending. Two touches results in a Wrong End of its own. Maneuver around him back to the four-way and go north to the next fork. Continue west and enter the long, narrow classroom again. avoid him but it is possible. Use the biggest area to have the most success. Leave the classroom and head east and then south to get back to the new path. The ghost is still following you so be speedy about it. Cross the gap and head into the only doorway over here, a staircase. You are now safe from the ghost. Climb up to a new part of the second floor, which probably looks familiar. Heading north will have Ayumi put down another candle. Feel free to use it. Go past the open infirmary door and head up the corridor. At the fork, go north over the gap and into the stairwell, as the path west is broken. In the bathrooms, entering the Boys' Lavatory and examining the westmost stall triggers a scene but isn't necessary to progress. Enter the Girls' Lavatory to trigger a scene. Move in farther to continue the scene. You will automatically leave the bathroom after. Approach Ayumi and talk to her. When given a dialogue choice, it again doesn't matter what you choose. When you regain control, do not go down the stairs. walk past Ayumi and into the Girls' Lavatory again. Inspect the black stain from before and the second stall from the left before leaving again. After a long scene, Ayumi will be back in your party. Go back downstairs and head south. Follow the ghost into the infirmary for a scene. Trying to approach doesn't do any good so simply leave the infirmary afterwards. You'll be treated to another lengthy scene. Heading back up the stairs for a moment to save is a good idea. Once done, head back down. The ghost is still here and should still be avoided. Head west across the gap and continue west past the four-way. Go up the stairs and head directly north to another set of stairs. An [Antique Doll (Head)] can be found here now. Take it and head back down these stairs, all the way south, and down the second set of stairs. Last time you have to avoid the ghost. Make your way east to the four-way fork and go north to the next fork. Take this one all the way east and you will find the [Antique Doll (Body)]. The game automatically combines the two into the [Pentient Spirit]. The ghost may or may not be around when you return. Go west and then south to the four-way fork. Go back east over the gap and up the stairs to the second floor. Head inside the Infirmary again for a scene. Go north when you get control for the final scenes of the chapter. Again, this may seem wrong but this is what is supposed to happen. Get eye-to-eye with the ghost in the long room or have him touch you one too many times when being chased. Don't follow Ayumi when she runs off. Continue on until after flipping both switches and returning to the four-way fork. Don't get the [Power Crystal], have the teacher keep it, or have it break by touching the ghost. Continue on until the part where Ayumi loses it in the bathroom area. When Yoshiki moves towards the stairs and you get control, go down them. Read all five Victim's Memoirs. They must be read in order to make the next appear. After the opening scenes, head out of the now very familiar clasroom. Head south and enter the other entrance to Classroom 1-A. Leave immediately and head back to the north. Continue on after a short scene and enter the only other available door. through the northern door. Head east out in the hallway and make sure to read the Victim's Memoirs near the gap. Go back west and through the classroom again. A scene will play. Dialogue choice again doesn't matter. Go back south after and head in the first western doorway to Classroom 1-A. Move south enough to see another board like the ones from the first chapter. This part is similar to the part with the Infirmary Key from the chapter. Note the board's location and go into the other classroom entrance. Your characters will realize what is going on. You can now push X on one side's board location and go into the other side to automatically collect the [Loose Board]. A scene will occur out in the hallway. Take Yuka's [scented Beads] when she offers them to you. Go south when you have control and use the board to cross the gap to the stairs. Go down to the first floor. Walk east to the four-way fork and head south first. Enter the entryway and walk down to the bottom of the room. Read the Victim's Memoirs 2/5 to make an event happen later on. Leave the entryway. The north path of the four-way is blocked for now so instead walk east. The ghost will stop you a couple of times but he isn't aggressive anymore. Just don't look into his eyes. Take the only doorway, a set of stairs, when you get to them. Go north past the two closed doorways and continue north when the path branches. On the stairwell you can find another [unknown Key]. Continue up to be back in the bathroom hallway. Go west a little ways for another scene. Follow Yuka when you get control, pause for a short bit of dialogue, and head into the Girls' Lavatory. Go west a short distance to see for yourself and leave. Walk back east and down the stairs to the second floor. Go south and past the first closed door. Use the key to unlock the Infirmary and go inside. There is another candle inside. Go to the beds in the corner for a few scenes. Pick whatever choice you want when prompted. A newspaper appears by the candle. Read it and now save before leaving the Infirmary. After the scene, grab the nearby [Nail Puller] and head back north, all the way back to the stairs and up them. You can use your new item to open the Boys' Lavatory. Go inside to see this isn't an option either. Leave the restroom and head back downstairs. now. Head back through the four-way. break the glass and get a [Tiny Key]. Leave the classroom and go back down the stairs to the south. Now you can check out that new hallway. Walk east through the four-way fork and past the stairwell entrance. The key will open the door on the east wall. Do so and head outside to a walkway to another wing of the school. Cross over and enter the other building when you can. You will find a candle here slightly to the south. Save and go west through the doorway. Enter the doorway to the north to find yet another destroyed bathroom. Leave and go west to a new staircase. Go up to the second floor and enter the open doorway on the east wall. Go east through two rooms. Continue east in the third to find a north/south fork. The north path is closed for now (The green slime will kill you!). Instead, go south to the first doorway on the east wall and enter. Head east in the Cursed Art Room for a short scene. Try talking to the girl in the top-right corner before leaving the room the way you came. Go north to see another girl. Follow her to the west and into another room. Try talking to her and she runs off again. Follow her again. Go through the next room, since she isn't here anymore. When you reach the stairs, you get a short scene. Go back east into the hallway to find that the blocked door here is now accessible. Try to open it for another scene. Back to the stairs and head back down to the first floor. Walk straight through the first room and back to the entryway. Make sure to save before going back out the northern entrance. Walk west halfway across the walkway for a scene. Be ready to run the second you get control. Go east and back inside for a scene. Go through the west door and through the room to the stairs. Back up to the second floor. Head through the first room and into the second for more events. Be ready to run when you get control, as you don't have much room to work with at first. Go back west through both rooms to the stairs and down to the first floor. Continue through the first room (avoid the bathroom door to the north) and go back to the entranceway. Move to the candle and then try to go back through the western door for a scene. Feel free to save again. Go back west, through the room, and up the stairs to the second floor. Your pursuer is gone. Go east through two rooms and back to the hallway with the north/south fork. Head south and into the art room on the right. Inspect the note in the middle of the room and leave. Keep going south. Ignore the other open doorway and go west down here to find another stairwell. Only one place to go here - back down to the first floor. Go east and you will see a door lock. Walk north a bit away from the door and it will unlock again. Go inside and over to the fallen cabinet in the middle-right part of the room. Your new character is strong enough to lift it. This gives you access to the desk that is in the third row and farthest to the right. Examine it for a pair of [blessed Shoes]. Now you can cross that slime. Leave the room. Take the nearby staircase to the west for the fastest path back. When you are upstairs, go east and north. Walk past the fork to the green slime and simply walk across it, now safe from harm. On the other side is a [Crystal of Unsealing] and another scene. When it's over, go south back to the fork and west into another room. Go through this room and into the next. Approach the door to the north to open it up with your new crystal. Inspect it and a long scene will play. When you get control again, head south and around the desks to the sparkling object. It is a [Mini-DV Tape], the contents of which you will discover in the next chapter. Head east and inspect the lengthy note in the lower-corner. Go back north and inspect the doorway to start the ending scenes of Chapter 3. Do not accept Yuka's [scented Beads]. Stare into the eyes of the ghost in the first floor west hall. Let Yuka be caught by the ghost out on the walkway when she is alone. Read all of the Victim's Memoirs. Scene triggers after last one near end of chapter. Walk on the green slime on the second floor of the second wing without the shoes until your HP drains. You will find yourself in the Infirmary hallway when you get control. Head north to be stopped for a few seconds. Continue north and be stopped briefly again. Follow the voice's instructions and head north into the stairwell. After the short scene, pick up [Naomi's Cell Phone]. Head all the way up to the bathroom hallway yet again. Pass the Boys' Lavatory and into the Girls' Lavatory. You will be repeatedly stopped as you move forward inside; just keep going until you reach the third stall. Try to leave for another scene. Walk back to the third stall and interact with it. Make sure to choose 'Kick in the door', 'Try to hold her up', 'Hoist her up on shoulders', and 'Reach behind to unfasten' to prevent a Wrong End. The next dialogue choice doesn't matter again. After the scenes, you will be in the Infirmary. Save at the candle and exit. Go south and down the stairs to the first floor. Walk slightly east to find that the pathway to the second wing is now closed again. You will get a few scenes too. When you take control of another character, just leave the room to trigger the next few scenes. You are now in control of yet another character. Head west to the first open doorway on the south wall and take it to a staircase. Go upstairs and in the first door on the right wall into the Infirmary. Pick up the [Pentient Spirit] from Chapter 2 nearby. Go east for a candle with a brief scene first. Go up to the beds and a scene will play. Just leave the room without getting too close to the ghost. Walk back south and down the stairs to the first floor. You will get a scene when you get there. Go up for a long scene before you regain control. At the top of the room is another candle. At the top left corner there is a bookshelf that'll give you a guide on how to use Chinese Zodiacs with the coordenates, it's useful for what comes next. Leave the room and head back to the south, past all the open doorways and into the southern stairwell. When back on the first floor, you get a brief hint where to go. Just head back east to the four-way fork and then take the path north to another fork. Go east here until you see the red door.This is where you can use the doll's hint to find the item you need, if you understand the hint you can go look for yourself but if not just continue reading to know where to get it. Go slightly west and examine the wall opposite the set of four windows. The spot you need is almost at the west corner of this wall. Just hit X a bunch while facing this wall in different spots to find it. You will get [Ryou's Tongue] after a scene. Head back west and then south at the fork. Go east at the four-way and take the stairwell on the south wall up to the second floor. Go into the nearby Infirmary and walk over to the ghost. You can now look him directly in the eyes to trigger a scene. Make sure to show him the tongue when given the option. Character switch again. Go west for a brief scene. Continue west, following the turn north and walking to a fork. Take the east path all the way to the end to see a sparkling object. It ends up being [seiko's Cell Phone] and triggers a short scene. Go back the way you came and take the staircase up to the Infirmary hallway. Go north for a scene. Afterwards, go back downstairs and back the way you just came but this time go inside the classroom through either of the open doors. Now, with two people, you can get this jumping item. Note the position of the sparkle when on one side and go to the other side, pressing X where you think it was. Go to the other side again and, if you were correct, you will get a [Custodian's Key]. A scene plays and you're back in the hallway. Go east and use the key to open the red door set in the north wall. A scene will occur and then you get control back. Inspect the television for another scene. When the note appears, inspect it for the final scene and another character change. Back in the Infirmary. You should probably save before leaving. Exit and head south back to the first floor. Go west to the four-way and then south to the entryway. Upon entering, you get another scene. More instructions. This time you need to go back north to the four-way and west this time, into the stairway. Go upstairs and approach the gap. Inspect the area right before the board covering the gap to find a [Winder]. Take this into the nearby classroom (through the top door) and go into the smaller room at the top-left. Examine the lever in the top-left corner of this room to use the Winder. When asked if you should force it, say yes. This opens a new passageway back on the first floor. Let's go there now. Leave the smaller room and Classroom 1-A and go back south and down the stairs. Saving is a good idea right now. The new path is just to the left here. Walk to the other end and leave through the other door. Start walking around the pool for a scene. Continue around the pool pathway to the other end to check a locked door to the Pump Room. Head back to see a new sparkle. Inspect it to pick up the [Pump Room Key]. A scene will now occur. Pay very close attention to the ripple in the pool when you are shown, as it doesn't show it for very long. Note that this timer never pauses, not on the menu or during the scenes. Make sure to hurry. Go back around the pool quickly and re-enter the Locker Room. Walk towards the east side of the room to trigger a scene. Afterwards, head out to the pool again. Climb into the pool via the ladder at the top-left corner and pick the spot where you think the ripple was. Your time will keep ticking if you pick wrong so don't mess up too many times. When you get it right, you will see another couple of scenes. Back in control, head back around the pool and into the Pump Room with your new key. In the top-right corner is a drainage valve you should use. Go back out to find the pool empty. Climb down the nearby ladder and go to the middle grate, inspecting the open part to find a [Rusted Valve Wheel]. Take it back into the Pump Room. Take it straight ahead to a very hard-to-see black spot on the middle machine and use the wheel on it. Go back out and into the pool again, this time to the top-right corner. You will find [Tokiko's Tongue]. Climb out of the pool in any way and head back into the locker room and out into the main hall again. Go south and take the stairwell. necessary. A long scene will play out and you will receive [Yuki's Tongue] as a result. Go back downstairs, then west and north t the fork to find two ghosts. Give them the tongues to trigger a long scene. You get control briefly again. Head over to Ayumi and talk to her, then talk to her again. Try to leave. You will trigger a very lengthy set of scenes that will finish the chapter. Either approach the ghost in the darkened Infirmary with Ayumi or give the wrong tongue to the eyeless spirit in the first floor west hall. Don't answer Naomi's Cell Phone. Fail to save Naomi. Meet up with a student in the Infirmary and tell her you are going to kill her. When Ayumi jumps into the pool, go to the Pump Room and use the Drainage valve. Go out of the room and into the pool. Don't save Ayumi in the pool in the time limit. Answer Naomi's Cell Phone. Fail to save Naomi. Meet up with a student in the Infirmary and tell her you aren't going to kill her. Leave the Infirmary. First thing to do in this chapter is a dialogue choice. The first choice will progress the scene automatically while the second choice will force to you first try leaving to the right to move the scene forward. After either choice, you will end up in the stairwell. Go down to the first floor. Saving at the candle on the way is probably a good idea. Moving partway through the first room will trigger another scene. The scene will move you to the entranceway for another chase, the longest yet. This chase requires you to run all over this building to escape so always be on guard for your pursuer. Do not approach the eastern doorway to save yourself a big headache. Just move a small bit east and wait for your pursuer to come into the room. Avoid him and go into the western door again. Pass through the room and into the stairwell, going back up to the second floor. Go east through the first two rooms on the second floor. Continue east to the fork and take it south. Follow the path west and north into another stairwell. Go back down to the first floor again to be in that room to the east of the entryway that was blocked earlier. Follow the path east and north to another fork. North has nothing of note so go west to find yourself back in the entryway. The [Front Door Key] is sitting here. If you followed the advice earlier, just go directly to the front here. If not, you have to go all the way back around. Use the key on the door to the north and cross the walkway into the other building. Walk west until a ghost appears to tell you where to go. Follow her into the stairway and head up. Go north a little ways and a scene will occur, ending the chase. You will see three more scenes after that one. During the third, you are given a choice. You must pick the first one or you will get a Wrong End later. When back in control, head south for a short scene in which you get a [Marble Statue]. Afterwards, leave the classroom for another scene. Go south for a brief scene. When it's done, continue down the stairs to the first floor. Start going east for another scene. You will receive [Naomi's Student ID] automatically as a result. Another scene plays after this one. Leave the room when it finishes for yet another scene. Walk a bit east for another. When you're back in control note the pentagrams. You use these to switch between the two groups. I will tell you when you need to switch, like right now. When in control of Satoshi's group, you will be brought over to the other wing. A candle is present and you probably want to save. Head out to the west. You get a scene when you enter and acquire [Yuka's Shoes]. Go west into the stairwell when you can for another scene. Now, you can go back two rooms to the east to the entryway again. Head up to see a person in between the shoe racks. Approach for a scene. You get a [Mini-DV Tape 2] from the encounter. You need to take this back to the janitor's closet. Save again if you like and head north and across the walkway back into the first wing. Before you see that tape, go past the new narrow pathway and take the southern door to the stairs. Head up to the second floor. Walk a bit north to see another lever. Using this now will save you time later, opening a path for your other team. When you've activated the lever, go back south and down the stairs. Go slightly east when down and walk up that narrow pathway to get to the red door. Go inside. Use the television to see what's on the tape. When finished, you can then open the nearby sliding door for a scene and a ladder up to the third floor that you take automatically. The dialogue choice during this scene makes no difference. You get [Mini-DV "Sin" Tape] near the end of it. Back in the bathroom hallway. Step onto the nearby pentagram to switch back to Ayumi's team. Going straight west, past the fork, leads to a candle if you wish to save. When done, go south at the fork. At the four-way fork, head south again and into the entryway. Walk to the bottom of the room to find [Naho's Notebook]. There are five entries of this, including this one, and you need all of them in order to ensure the best ending. Make sure to get them when I note their appearances. Leave the entryway and return to the four-way. Go west to the staircase and head up. A short ways north, right past the first door, is another Naho's Notes (2/5). Read through it and head back south and down the stairs. Go a bit east and you will see another Naho's Notes (3/5). Pick these up too. Back up the stairs to the west. This time, let's go past the open door and up to the fork. West is that bridge you made earlier so let's cross it and save at the candle. As you continue west past the candle, you will see the window splash red with blood. Examine it after that happens to open the door. Go inside. Do not examine the covered model near the doorway. Walk south in the room to find Naho's Notes (4/5). After you read them, leave the classroom the way you entered. Head east across the gap and south to that open doorway on the left side of the hall. On the left side of the room, are Naho's Notes (5/5). Go ahead and leave once you've gotten them. Head back up and west past the candle. Take the open doorway all the way to the west for a stairway up to the third floor. Go right and into the first classroom door for a long scene. You get a [baby Statue] at the end. Leave the room and head east the rest of the way to meet up with the others. A scene will play before you take control of them. When you can move again, go east and down the stairs. All that is down here is a switch to open a path for the others again. Go back up after you've done this and head into the second door, the Girls' Lavatory. Walk into the open stall to return to the first floor and leave the janitor's closet. Head south through the narrow pathway and take the stairs to the west.This time, go east when you get up here and you will find a door with two pedestals in front of it and a candle. Save if you want and use your statues on the slots to open the wall up. Go inside and head north a bit for a scene. You automatically enter the next room. Move up and a scene plays. You leave automatically as well and head all the way out to the candle area for another scene. Save if you didn't before and start walking back to see a new sparkle. Examine it for a [black Cat Plushie]. Go south and back down to the first floor. Head east and exit out to the walkway. Start walking east for a scene. You will get a [Principal's Key] as a result. Continue into the other wing. Save if you didn't earlier and go west through another room back to the stairs. Go all the way up to the third floor and use your key to open this door. A short scene plays before you can move. Head to the top of the desk to pick up the sparkle, getting [sachiko's Tongue] and watching a scene. You probably see the nearby small entrance just to the right of your current position. Examine it to move to a new area but first is a character switch. Enter the nearby room just to the west for a bit of exposition. Leave when you can and take the stairs to the west back downstairs. A long scene plays out. You find yourself in a new place when it's done. Head south to a new hall. Here's that other path you opened earlier. Cross over the gap and head east to trigger a scene. Finish walking east when you can and enter the room the game shows as ???. Move east through a small passage to an attached room with a large pentagram on the ground. A long scene will play out in which you get a dialogue choice. The one you choose doesn't matter. Another scene plays when you leave the room. The choice during this one again doesn't matter. Back to the others. Head west and north at the fork. A scene will play. Go a bit farther north and another scene plays. The path the ghost goes tells you which path you should take through the hall. If you weren't paying attention, it went right twice, left once, and right twice again. Continue through the hall for another scene. Afterwards, use the nearby lever to open a path. Go south and across the gap to find another lever. Back over the gap, go east this time and south, across another gap and around a corner. Use this lever to open that gap up to the north you just passed. Cross over the first gap and continue over the second. Follow the path until you reach another lever. Backtrack slightly to cross over and pull the final lever, allowing you to return west and cross to a candle. Save and head up. Ignore the doorway and move into the maze-like room for another ghost scene. You can take the ghost path but it's easier to just go right, right, up, left, left, up, left, down, down, left, up, up, and up to make it across and into another hallway. Take the doorway you see immediately. You will see a scene inside. Inspect the wardrobe in the corner and try to leave for another. You'll be back in the hallway when it's done. Go north to see a candle to the west. You can save here if you want but do not go past it into the doorway. You will get a Wrong End if you do. Go east when you're ready and follow the blood until you encounter another scene. Head west and follow the turn to switch characters. Leave the room to bump into each other and see a scene. Go north a bit for a few more. When you regain control, there is a candle. This is the last one and saving is a very good idea. Go north when you are ready. Move west through this small room. A long set of scenes will start and you are given a few important choices during them. Offer [sachiko's Tongue] and the [black Cat Plushie]. Do not offer [Naho's Notebook] or the [Mini-DV "Sin" Tape]. If you do it wrong, you get a Wrong End. You now have to chant the right number of times. There are five characters and you must chant an extra time on top of that. The game doesn't count for you so don't lose track of it. Everyone chants once, except Satoshi who says it twice. Choose to not chant once you've done six. Now it's time to escape. Your timer is the bells that start to chime as you run. Once you hear seven, you will fail. This time does not pause in the menu either so don't think you can cheat it. All you have to do is run all the way back along the path you just took to the part where the ladder was at the beginning. Instead of turning right to the ladder, keep going down to exit the basement. Escape the school (through the door that leads you to the second building) to finish the game. if you can't remember how to escape the path will be down bellow, however you won't have much time to look at this. You have to go pretty quickly to make it. A good thing to remember is to avoid any side doors; they aren't the right way. Head east out of the small room first. Run south, past the door and into the next hall. Head around the corner and south at the first fork. Round another corner and south at this fork too. Don't take the doorway. For the maze, go down all the way along the west wall and then go right, up, up, right, down, right, right, down, left and left to exit. Head south down the hall and pass the doorway to the right. Pass the candle and cross the gap. Don't take the first path south but take the second. Go west at the first fork and north at the second. Follow the path around to be at the skull part. Go right twice, left once, and right twice again to get through. To finish: Pass the door to the left and the path to the right and go south to be back in the school. Go east all the way, past the fork and until you see the red door. Run south through the narrow pathway, avoiding the holes in the ground. Head east as soon as you're out and through the open doorway. Watch the several scenes play out and the credits and you should be done if you followed everything in this guide! Progress to the end as if going for the good ending. When Ayumi runs off in search of Seiko, go south from the candle and into a bathroom hallway. Once you trigger the scene, enter the bathroom for another. When you get control again, go to the end. Chant five times instead of six (because Naomi isn't there). Escape the school. Inspect the covered model in the Science Lab and head south. After reading Naho's Notes, go north. Let one of the pursuers grab you. Let Yuka get caught or have Yoshiki refuse to go back. Progress onwards like normal until everything goes wrong. When you get everyone back near the end, head back south and down the hall to the east after Naomi. Give Sachiko the wrong items. Pick the wrong number of chants or fail to escape the school in time. 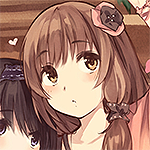 Do not pick up all of Naho's Notes and progress to the point where everyone meets up near the end. These chapters include various scenes from other students that came to the Heavenly Lost in the past. They are not linked to the main story but their bodies and notes can be found through out the main playthrough. They are unlocked by obtaining certain endings in the main 5 chapters. Walk west to trigger a short scene. Continue on to find [Chihaya's Pouch]. Try to leave the bathroom for a brief scene. Go back west a bit for another. Keep going when you can and examine the ghost for more. Now you can leave the bathroom. More scenes. When given a choice, agree to look for the ghost's items. Head west and into the Girls' Lavatory when given the chance. Inspect the westmost stall for a message. Keep following them and you will end up with [superstar Sunlasses]. Leave the bathroom. Head into the Boys' Lavatory again and offer the glasses to the ghost. Not the right ones. Go back out and east to the stairs. Head down to the first floor. Go all the way south to another stairwell to find the [Distinguished Glasses]. Take these back north, up the stairs, and into the Boys' Lavatory. Offer these to the ghost to get your next objective - a hat. Leave the room and go slightly east to see some new spirits. The stationary one has a hint;the bottom right one doesn't (it totally does) have an item. Leave the room and reenter to see which one to inspect and do so to receive an [infirmary Key]. The others will hurt you so don't mess up too much. Head downstairs and south. Use the key on the second door to the right to open up the Infirmary and go inside. To the east inside you will find a [Felt Hat]. Try to leave for a scene. You are brought back to the Boys' Lavatory automatically. After the scene, talk to both other girls and leave to finish. After the opening scenes, head east into the next room. Walk east and take the door on the north wall and go deeper inside for a scene. Leave and try to leave to the east for another. Already done. Unlocked by completing the Extra End in Chapter 4. Unlocked by completing the True End in Chapter 4. Unlocked by completing the Wrong End 2 in Chapter 5. Unlocked by completing the True End in Chapter 5. Unlocked by completing the Wrong End 6 in Chapter 5. Unlocked by completing the ending to Extra Chapter 6. There are several corpses and notes spread around each room and hallway. They are not required to actually complete a chapter but in the menu you can view all of them in detail. This tag can not be found in the American and European versions of the game due to a glitch that prevents you from entering. The following section will cover exclusive content from specific ports of the game, being them respectively the 3DS and Steam ports. Two new endings one for chapter 1 (Exclusive), and one for chapter 5 (Also appears at the Original and Steam Release). This ending does not exist in BloodCovered, having been added for BloodCovered...Repeated Fear 3DS. It involves collecting the infamous Victim's Memoirs. NOTE:Read all five of the Victim's Memoirs. This becomes possible once it is possible to exit Classroom 2-A from the northern (up) door (east (right) door in hallway). NOTE:A new cutsene will play during one of the steps (step 17) in Chapter 5. Try to go to the entryway. Go downstairs and move toward the center of the hallway. Go east (right). (This unlocks party switch using pentagrams. Some of the following can be done in alternate orders.) Go west (left) and read the notes near the basement door. Go west (left) until Satoshi reaches the stairwell, then pick up Morishige's phone. Return to the entryway and examine Yuka. Return to the main building and switch to Ayumi. Go to the entryway and examine the notebook. Go to the second floor and examine the loose pages. Return to the first floor and examine the third set of notes. Switch to Satoshi. Go up to the second floor and use the lever, then switch to Ayumi. Examine the blood on the science lab window, then enter. Examine the fourth set of notes. Try to leave. During the attack, avoid the anatomical model and Yoshikazu. Get the key from the southeast (down-right) corner, then escape the room. Return to Classroom 1-A to find the final set of notes. Go to 3F and enter the reference room. Switch to Satoshi using the third floor pentagram. Go to the custodian's closet and watch the TV. Afterward, open the north door. Choose either option. Use the third floor pentagram. let the timer run out. Unlocked by completing the EX. Chapter 1 and By Getting Chapter 5 True End. 1-After the cutsene, walk towards north until you reach a intersection, then move right until a cutsene plays. After that feel free to talk to the Red Spirits they won't hurt you (they appear all the way down to the infirmary, so go down south (down) to talk to them). 2-Now go north (up), and up the staircase to go to the restrooms, move west (left) until a cutsene plays. Then...You're Done! The rest of the chapter is read-only. Unlocked by completing the Chapters 5 True End. 1-After the cutsene plays, exit the room trough the northern (up) door, move east (right) until you reach a intersection, then move down south trough the hallway, move down the staircase a cutsene play. After the cutsene return to the classroom where Naomi and Sachiko was, exit the classroom trough the southern (down) door, the head south down the hallway. 2-Head down the staircase until you reach the first floor, head east (right) and then down the entryway, try to open the door, then try to exit the room. A Blue Host will appear and try to kill you, you need to read the note on the right side of the door you entered the room, read it. Escape the ghost once again trough the middle of the room, and try to open the bottom door again. Now try to open the top door, when choices are give, choose the top choice. 2-Let the ghost catch you. 3-After the cutsene, read the red mark at the wall, then walk across the room, but DON'T LOOK the ghost in the eyes. Examine the closet when options are given choose the top option two times. 3-Look at the blue ghost. 4-After the cutsene ends, go left immediately so you don't get caught by the pursuer, you will come across a intersection, go south (down). Go up the staircase (read mark in the wall if you want to). Then the rest plays out by itself. 4-Let the pursuer catch you. Unlocked by Getting Chapter 3 True End. 1-Follow the student ou of the room, when giving choices choose any, both will lead to different text, but the same outcome. After the cutsene go down south (down), and down the staircase until you reach the first floor. 2-Now go east (right) and cutsene will play then...that's it. Unlocked by Getting Chapter 5 True End. One new ending for Chapter 5 (also appears at the 3DS version). 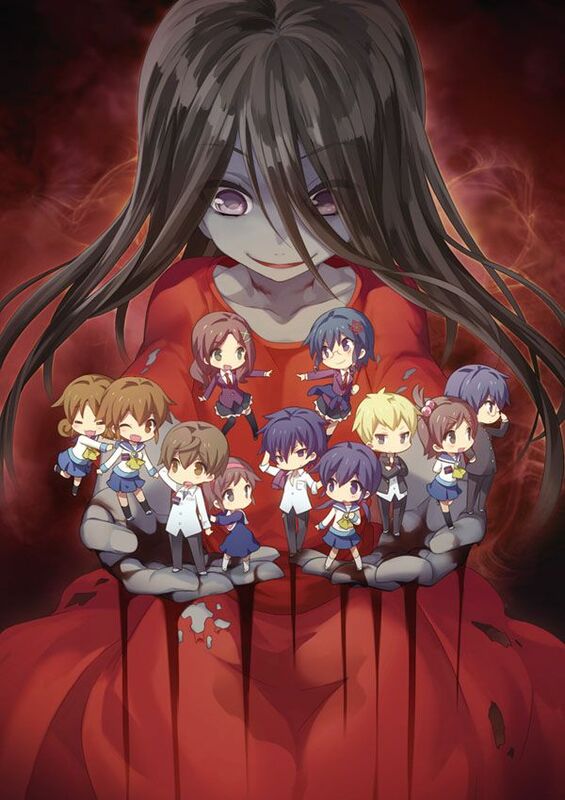 A remake of the fifth chapter of Corpse Party:Book of Shadows. Talk to the blue spirit and read the notes on the walls then go south (down) to pick up the unknown key. Avoid red spaces (they are traps and inflict damage). Use the unknown key to enter Classroom 3-A. Pull the lever and exit, going south (down) down the hallway and downstairs. There's a SAVE POINT down the infirmary!Go to the entryway. Afterward, try to return to the third floor. Step 1:Go in the red spaces multiple times until your HP equals 0. Go to the west (left) end of the second floor through Classroom 3-A. Near the northwest (up-left) stairwell, a number of fake traps will appear. The slightly brighter traps are safe to step on. Enter the stairwell and pull the lever. Try to return to the third floor. Run into Classroom 3-A and pull the lever, then go downstairs (avoid the ghost chasing you). Step 3:Let the ghost catch you. Another ghost begins chasing you here, so avoid it to get to the west (left) stairwell and go upstairs. Step 4:Let the the other ghost catch you. Go north (up) and pick up the gemstone to end the chase. Pull the lever. Using the new bridge, return to the third floor. Choose either option. There are a total of seventeen achieviments to unlock, you'll unlock all of them if you get all endings and name tags. Attained all endings in Chapter 1. Attained all endings in Chapter 3. Attained all endings and found every name tag. Attained all endings in Chapter 4. Attained the "loop ending" to Chapter 5. Attained the true ending to Chapter 5. Attained all endings in Chapter 2. Attained the alternate ending to Chapter 5. Completed Meeting of the Minds. Completed She Knows a Key. EX.1 have two alternate ends, one being a dead end, and other being a alternative end. Walk west (left) to trigger a short scene. Continue on to find [Chihaya's Pouch]. Try to leave the bathroom for a brief scene. Go back west (left) a bit for another. Now leave the bathroom (DON'T TALK TO THE BLUE GHOST!). During the part with red spirits, talk to the ones that hurt until your HP reaches 0. This walkthrough is based on the steam guide made by Jackkel Dragon, NoseBleed Corpse Party: Blood Covered Walkthrough and Exophase trophy guide. Some extra information from Corpse Party Wiki.